Squash House Quilts: Camels and Meringues! Where does the time go when you're retired?! I've had my hands in quite a few projects lately. Between that and the change to Daylight Savings Time, I need a vacation! Over the weekend Mr. Squash and I decided to drive to a few small neighboring cities. Along the way we saw that Izzy the Camel was out enjoying the sunshine with his buddies. We pulled over the get a photo and he was kind enough to give us this wonderful pose! Across the road the sun was shining on the winter wheat making a gorgeous pattern. I just love driving these roads all year long. The wheat in it's different stages is always amazing sight. Yesterday I got the bug to make my Coconut Cream Pie. I usually like to make it for Easter, but this year we're going out, so I thought why wait? The meringue turned out really good this time. From the counter to the top it measures six inches! You can find the recipe for the Pate Brisee here and the recipe for the pie here. I've never been able to make all the cute little loops at the top like Martha does, but I guarantee the taste is really good! I finished quilting my little Churn Dash quilt and am applying the binding now. 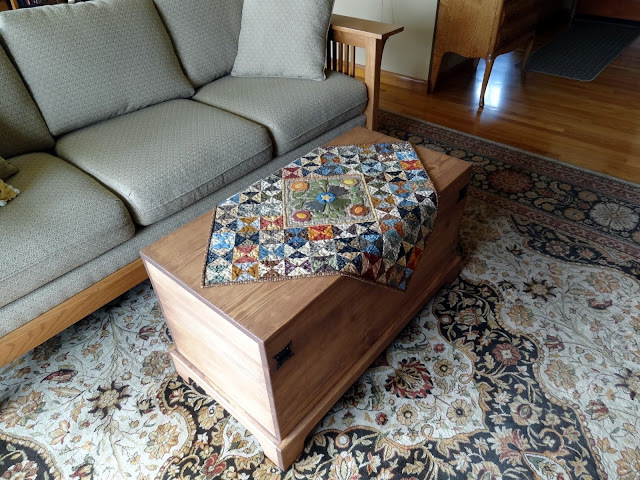 I also tried putting a nice quilt on top of our new blanket chest - it's a winner - don't you think? Love your blanket chest adorned with that fabulous quilt! It looks like it belongs there! Izzy is so cute. I just love his pose. Nice little quilt on your blanket chest. Very nice fabrics. That is quite a meringue pie!! It's so pretty, I'd be afraid to dive into it! Izzy has such a sweet face and don't you long for a camel's luxurious eyelashes? I love taking the road less traveled. Looks like you had a gorgeous day for driving. What a perfect quilt for your chest. Izzy is just way too cute! 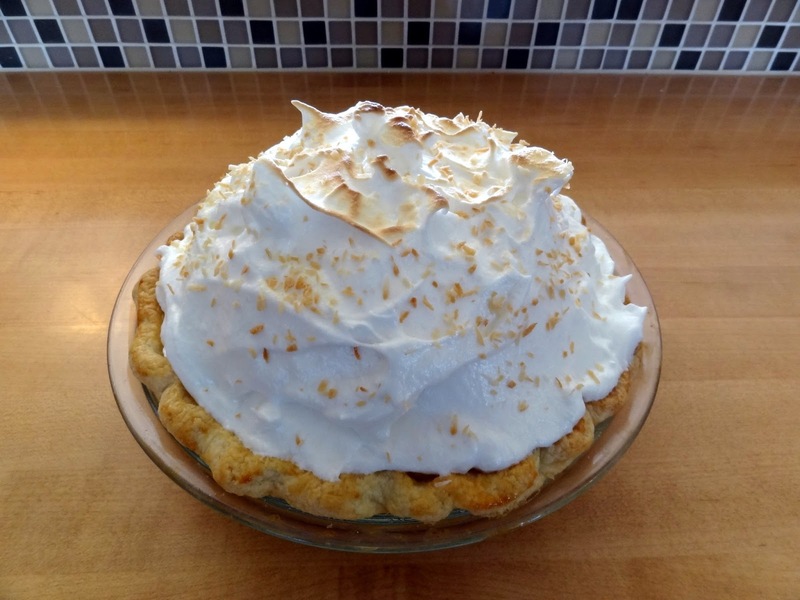 Your pie looks wonderful - I love Coconut Cream pie, but DH does not, so I don't ever make it. The little quilt on your blanket chest is perfect! That looks like my type of road too. Beautiful and I enjoyed seeing the camel. Your quilt is darling on top of the chest. 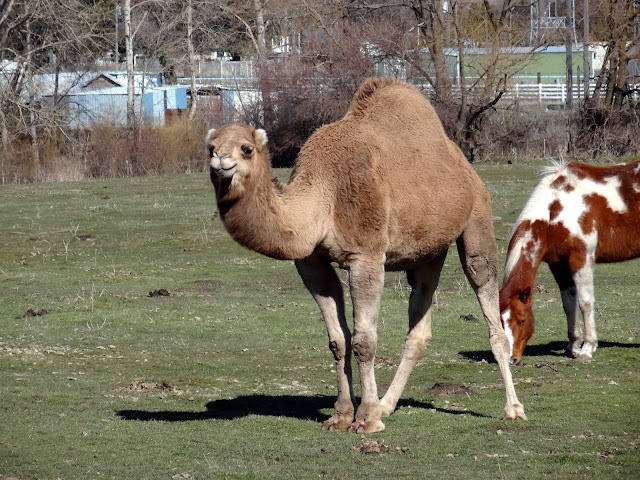 Camels in Washington is an odd sight, but a fun photograph! I like the winter wheat pattern too :) Love your little quilt on the chest. That's quite a meringue! Love your little quilt, it's gorgeous. And that pie, that happens to be my favorite pie and I try not to eat it because of the zillion calories, but I may have to make one for company this weekend. Your pie is a work of art my friend. Hugs!! Izzy is so cute! She would put a smile on anyone's face. so glad to hear you're enjoying retirement. I hope I make it there someday. Not the ordinary thing you'd expect to see on a drive, huh? Camels just aren't that common but does look interesting. 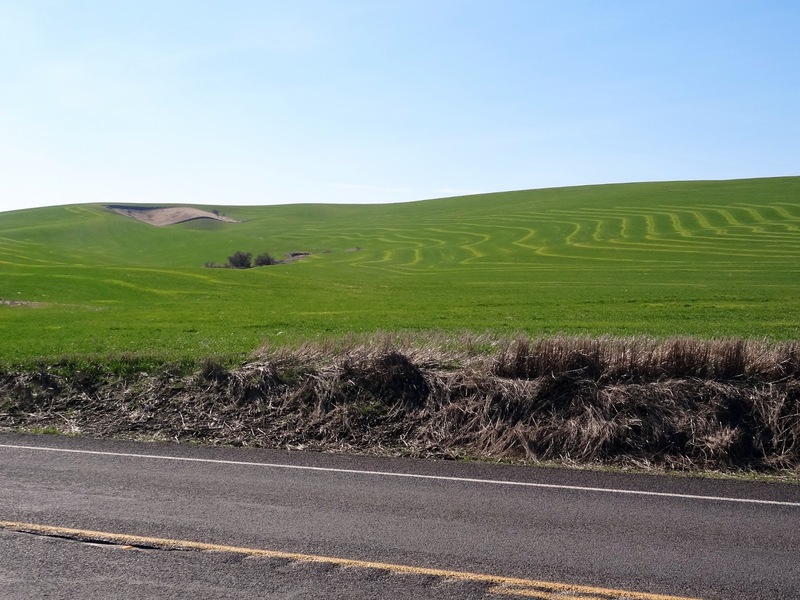 I love photos of the Palouse in all its seasons. Love the quilt on the blanket chest, too. Oh yes, it's definitely a winner! Oh, that pie looks amazing and so does your topper. I love those green wheat fields. Really pretty green. Oh, your quilt is so pretty. Well done. It looks wonderful. Such. Lovely quilt! Cindy, your pie is absolutely gorgeous. Just happens to be my husband's favorite. Love your little topper, I have one like it which I really enjoyed making. Coconut cream pie??? Mr. PQ's all time favorite!!! I don't dare show him the picture or he'll be bugging me to make one...today! Your little quilt was made for the little blanket chest. It looks perfect there. Sounds like you both are itching to get busy in the garden. I KNOW the feeling! You seem to be so much ahead of us towards spring! The pie mountain looks delicious. You have the perfect quilt for the new chest. I enjoy your travel pictures a lot! There are so many eye catching views along the way. These camels are adorable! Candace, you quilt looks so pretty draping over your new coffee table! Perfect pair!